Scirocco is a single shaft drive diesel powered hard chine river cruiser manufactured by Swancraft Boat Services using the Birchwood 370 mouldings. 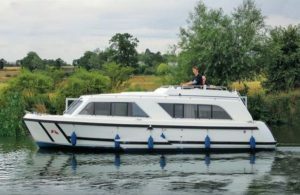 The boat offers extremely stylish design, a spacious cockpit with ample seating with an interior that is fitted with 3 cabins, a wet room and galley. 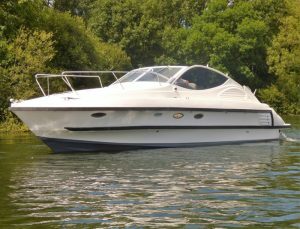 This Falcon 29 is presented to the highest standards and has a large interior cabin space. The cockpit is a large sociable area that can seat up to 8 people. 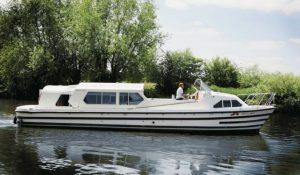 With her Volvo engines she can be used on the river or for coastal cruising. 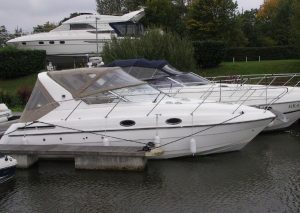 Superb centre steering cruiser with full electric sliding roof over spacious saloon. 2 singles & 2 doubles or 4 singles & 1 double in 3 cabins & saloon. Forward double berth cabin with en-suite shower room. 2 toilets, 2 showers, warm air heating. Ex hire fleet.